You may wondering how to add Blogger posts to different categories, and how to make them visible for blog visitors to access. Here's a brief introduction. Blogger uses a different term when regarding category, it's called "label". You can create / add labels to a post when doing the composing. 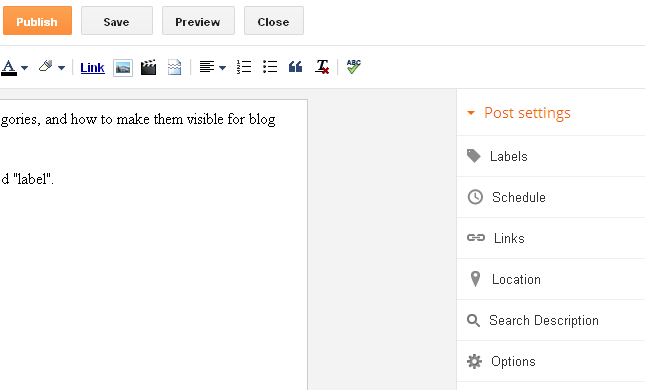 When you add several labels to a post, the post will be published to those categories (labels). For example, if your post is talking about free video editing software, your may want to add several labels like "video editing", "software", "free software" to the post. There are 3 ways for your blog visitors to access categories- from the bottom of each post, from the Label Widget, and from the top menu tabs. And the labels are clickable. If a visitor click on video editing, then all the posts in "video editing" category will be showing up in front of the visitor. Blogger provides a Labels widget for you to add Labels to the side bar. Labels can be displayed in 2 ways: Label list and Label cloud. You can add the Label widget by going to (from dashboard) Layout->add a gadget->click on "Labels"
The Labels Widget shows all the labels (by default) or you can pick which one to display. Once you save the Labels widget, it will show up at the your side bar, with the Label names. What's your experience of using labels and categorizing the posts? Share your insights in the comments box below.